This page will feature research by members of the Friends. by	John	Magnuson,	Center	for	Limnology,	UW-­‐Madison. Download as pdf file. 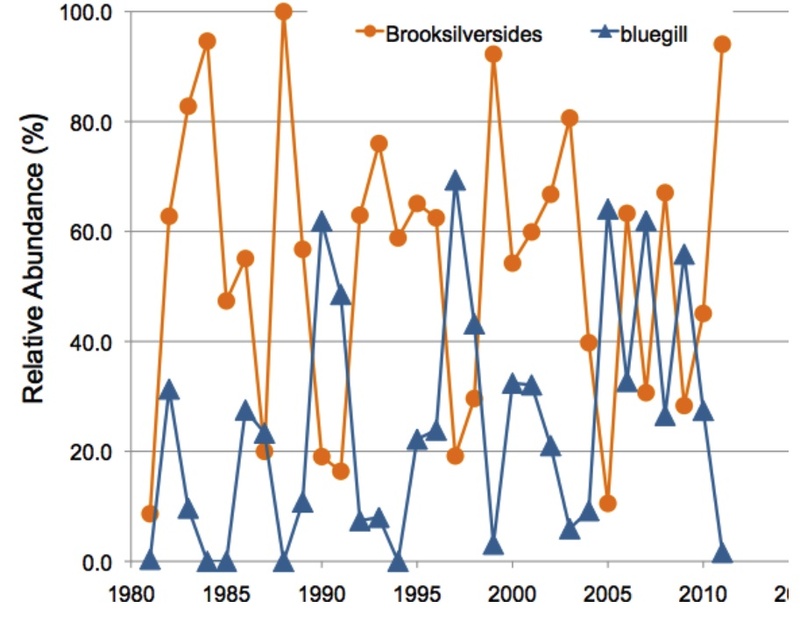 Data from the Center for Limnology’s Long-Term Ecological Research Program funded by the National Science Foundation. •The most abundant species caught in fyke nets and seines are the Brook Silversides, followed by Bluegill, Black Crappie, and Bluntnose Minnow. •The next most abundant are White Bass, White Crappie, Spottail Shiner, Rock Bass, Yellow Perch, Walleye, and Logperch. •The other 32 species are rare on average, but can be abundant is some years. •When other gear such as electoshockers and offshore gill nets are included, a total of 48 species have been caught in our samples from 1981-2011. Brook Silversides are 2-3 inches long; southern Wisconsin lakes and rivers; spawn in shallow waters from May through August; short lived (only 15-17 months) and only spawn in one year as yearlings and then die; young initially school in offshore waters, but then move inshore at night; food includes zooplankton, phytoplankton, and insect larvae, eggs, and pupae and spiders; attracted to lights at night; adapted to feeding at the surface. Bluegills are 5-7 inches long; lakes and rivers throughout Wisconsin; spawn in shallows from May through August. The male makes a shallow nest depression in sand or gravel usually in colonies of 40 to 50 nests; the male defends the nest before and after spawning. A 4 to 8 year old bluegill release 25,000 to 46,000 eggs; bluegills mostly eat aquatic insects, but also small crayfish and small fish, and some plants; a warm water fish with range typically not extending into Canada; the best known and most sought-after sunfish. 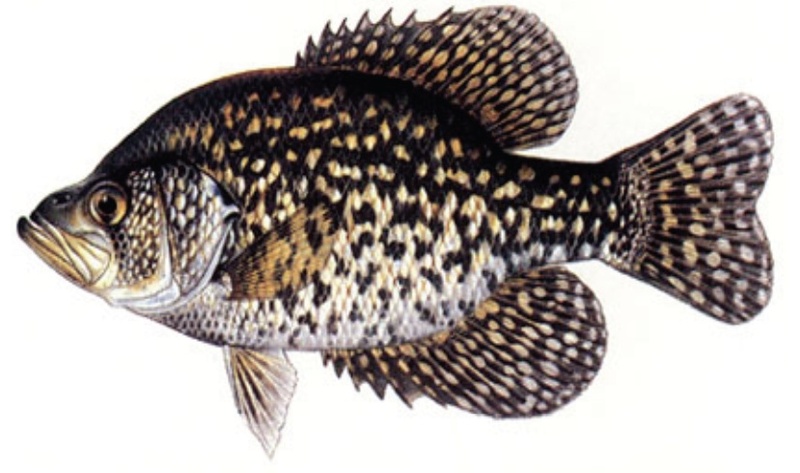 The Black Crappie is 7 to 10 inches long; lakes and river backwaters and moving northward throughout Wisconsin; spawns in May to June; males build and defend shallow nests in sand and fine gravel near vegetation in less than 2m of water; typically nests are spaced out by 1.5 to 2 meters; 3 to 8 year old females produce 3,000 to 188,000 eggs; they eat zooplankton, aquatic insects, and small fish; they are a warmwater fish; an important game fish. The Bluntnose Minnow is 2.5 inch average length; widely distributed in lakes, ponds, streams, and rivers throughout Wisconsin; spawning usually occurs at night; males build a nest on sand or gravel shoals under a log or bark or rock or mussel shell; the male defends the nest often driving away intruders twice his size; eats small animals and algae on the bottom. 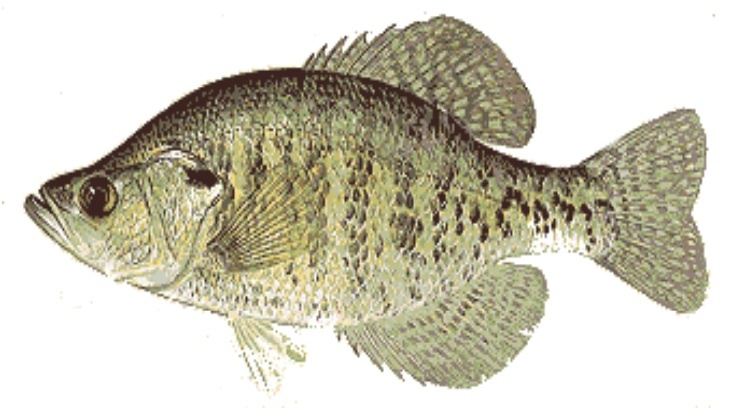 The White Crappie is typically 6.5-9 inches long; lakes and rivers and backwaters of waters in the Mississippi and Lake Michigan basins; spawn in May and June, males make and defend nests in shallow waters generally within 10 meters of shore on hard clay, or gravel, or roots of aquatic and terrestrial plants; the cleared but flat nests occur in colonies of up to 35 nests; young eat micro-crustaceans and shift to larger prey including insects and small fishes; a schooling fish; more nocturnal than diurnal. The Spottail Shiner is 2-3 inches long; big rivers and boundary waters of Lake Michigan and Lake Superior and large inland lakes; in areas with sparse to moderate vegetation; spawn in May and June in closely packed groups over gravel or sandy shoals; no nest building; females with 1,000 to 4,000 eggs; Broad diet includes invertebrates that life on the surface, in mid-water and on the bottom; often living in open water. 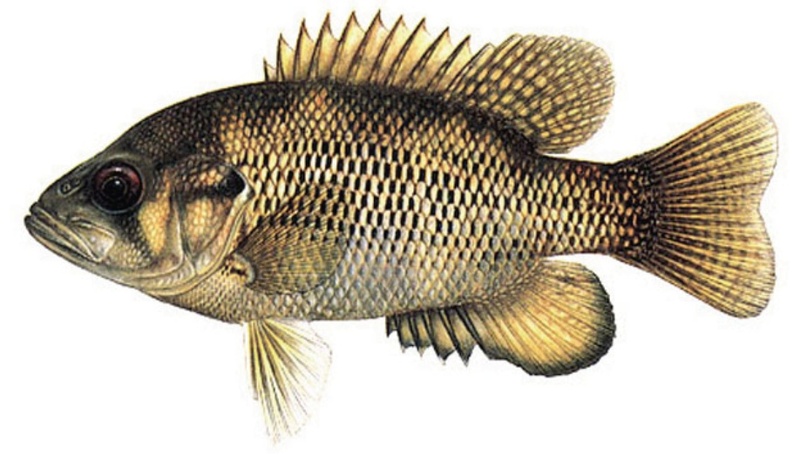 The Rock Bass is 6-8 inches long; throughout Wisconsin but more common to the north; lives in clear, cool, to warming waters over gravel or rocky bottom with some vegetation present; males make and defend nest; shortly after hatching the young leave the nest and are on their own; young eat a variety of crustaceans and insects, small fishes and crayfish; a cooler loving warm water fish. 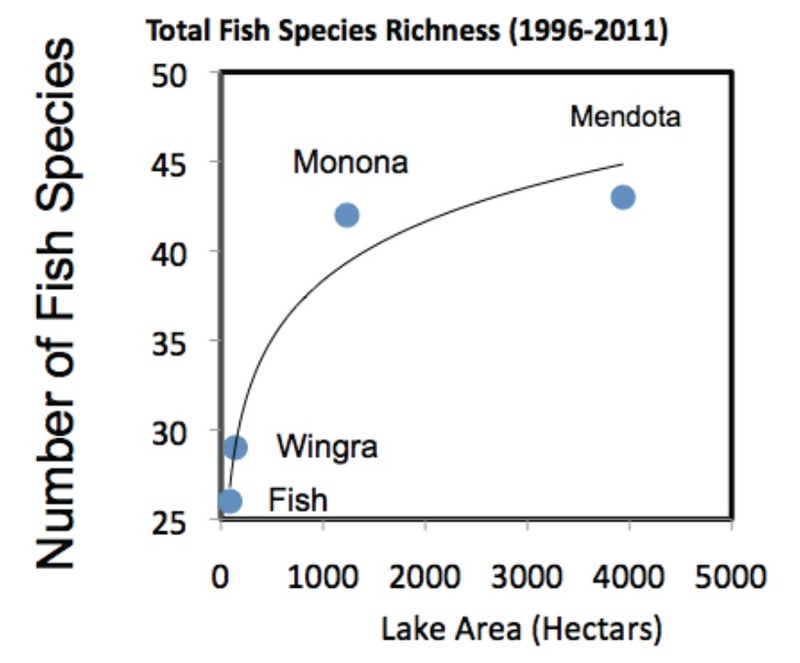 Variation from year to year in the two most abundant fishes in Lake Mendota; each point represents a different year (1981-2011). Data from the Center for Limnology’s Long-Term Ecological Research Program funded by the National Science Foundation. 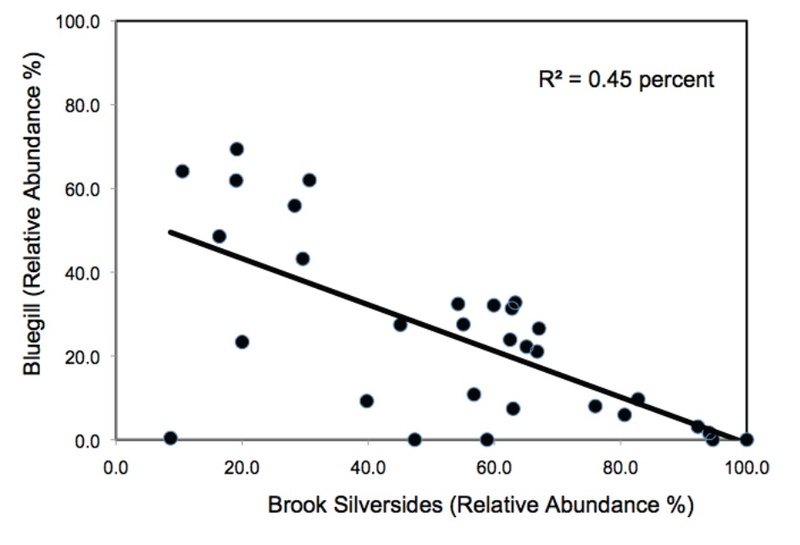 Abundance of Bluegill versus Brook Silversides. Each point is a different year (1981-2011). Data from the Center for Limnology’s Long-Term Ecological Research Program funded by the National Science Foundation. 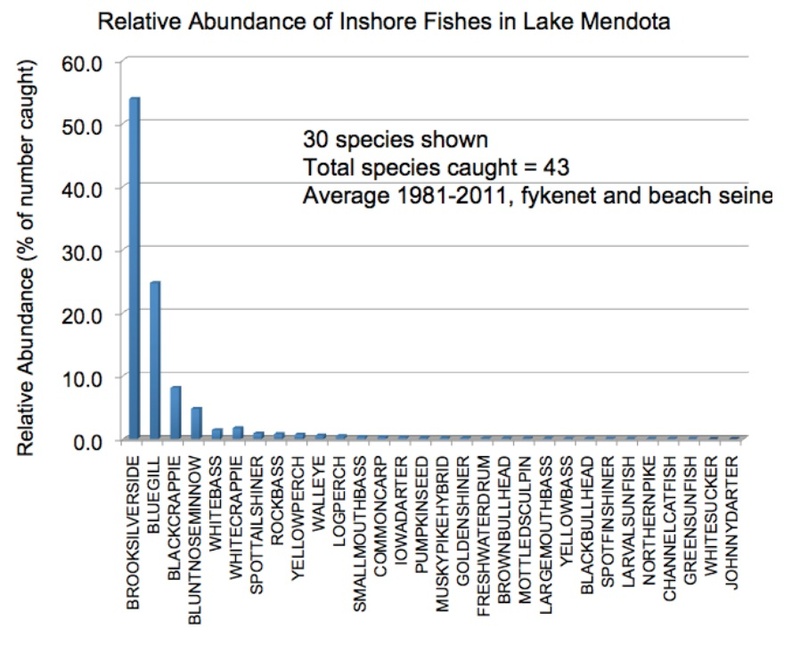 Dynamics of losses and arrivals of fishes in Lake Mendota from late 1800 to late 1900s. 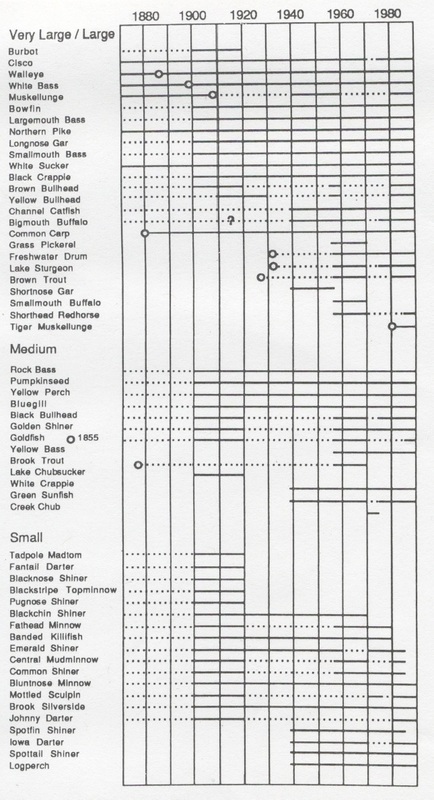 Lathrop and Magnuson (1992) in Kitchell, Food Web Management.